Vancouver Martial Arts | Martial Arts news, articles, videos and more! What are some of the common mistakes you see people make with their diet for weight loss? Metabolism is charged by active fuel and if not ignited every 3-4 hours the body goes into an idle state. This will cause low energy, fat storage, risk of losing muscle and poor performance when exercising or competing. Another common mistake is not eating metabolically active meals. Each meal should be balanced with either a protein or essential fat and then paired with a metabolically active carbohydrate. I primarily work with a glycemic index system rather than calorie counting. Food has a huge affect on blood glucose levels which will dictate energy, muscle maintenance/growth and fat metabolism. For example, processed foods are very high in glycemic index with little to no nutrient content and will build up toxins in the digestive system if eaten in exess. Depending on the clients goals, activity level, genetics, and muscle mass I adjust what type of carbs they eat with either a protein or essential fat. Clients don’t have to waste time and energy on worrying about counting calories and this way I can keep my clients satisfied all day from this approach. What are some general advice that would apply to everyone regarding weight loss and diet? 1) Keep in tune with how you feel after eating a meal or snack: Is it giving you energy or making you tired? Are you craving sweets after you eat? If so, your meals are not balanced properly or you may have a digestive concern. 2) If you are exercising regularly and not losing weight? There is a nutrient imbalance in your fuel intake and you are possibly losing muscle mass. 3) Be aware of your bowel movements: Are you having daily BMs and if not this can cause a big slow down in weight loss, chronic headaches, mood swings and other. Healthy digestion is key to a efficient body and mind. What is the right way for weight loss for athletes who want to make weight and some of the common mistakes you see? Not eating enough prior to the event to make weight. This will sacrifice muscle and overall performance. The ultimate goal is to drop body fat weight and keep your muscle. In order to do this effectively you must consume high protein and low glycemic carb meals as you approach competition. Along with a light cardio and sodium load/drop phase 2 weeks out. After weigh in drink plenty of coconut water and high glycemic index carbs to have energy reserves for fight day! Leanne Babcock started in the fitness industry over 20 years ago. While continually instructing various fitness classes, Leanne acquired her Fitness Leadership Diploma, ACE Personal Training Certification and various other certifications over time. Sweat Technologies Inc. in Fort St. John B.C. where she instructed various types of Group Fitness Classes, developed a Post Rehab program for ICBC and developed an ongoing First Nations Fitness Program. Advancing her ambitions she started another business in Grande Prairie, A.B., Velocity Fitness that branched further into Competitive Fitness Training. Leanne competed for four years winning the Alberta Overall Fitness Champion Title in 2004 and placing top six in her years of Canadian National Competition. With her success in this competitive sport, Leanne has dieted and trained many aspiring competitors who all proudly made it to a competitive level. Currently Leanne is a contractor for Team Fitness in North Vancouver, B.C. where she specializes in providing online Meal Planning Services to clients who are looking to lose weight, gain weight and/or go to a competitive level. Throughout her accomplishments and business endeavors, Leanne attended International Conferences and Seminars to keep up with the leading edge of Fitness Professionals. In order to achieve; you must have a plan. Only then will your inspiration grow and take you where you want to be. Stay focused on your plan! Go Yoga and Fitness Inc. While still not an Olympic sport, Karate is probably the most well-known martial art of the world. With the rise of MMA people sometime forget where the fundamental techniques come from. Karate is the art of fighting, self-discipline and self-improvement. As a student of both traditional martial arts and modern disciplines I appreciate both aspects and have been trying to give recognition to the instructors who have devoted their lives to martial arts. I knew of Ali Khanjari from many years ago when we were both in Iran. WAKO the biggest Kickboxing organization of the world was just getting started in Iran and he was a very talented and experienced fighter already who found his way to the international tournaments. At that time I was working as a contributing editor of the best martial arts magazine of Iran and we were covering his achievements. 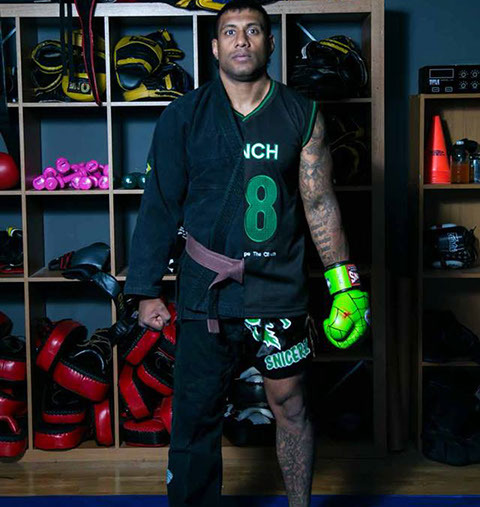 Here is our interview with Sal Snickers one of the successful instructors and martial arts school owners with extensive experience in martial arts from judo to mma.